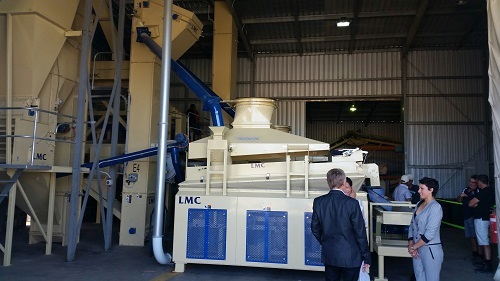 5 February 2015 - Michael Francis, Pneuvay Engineering's Managing Director, attended the launch of WIMPAK's new industrial grain cleaning plant at Minyip Western Victoria, which is comprised of a pneumatic conveying system designed and supplied by Pneuvay. Mr. Geoff Rethus, Chairman of Wimpak addressing the crowd at the launch. The event was launched by Mr Geoff Rethus, the Chairman of Wimpak, and MLA Emma Kealy, local member for Lowan. It was attended by over 150 people including suppliers and buyers. 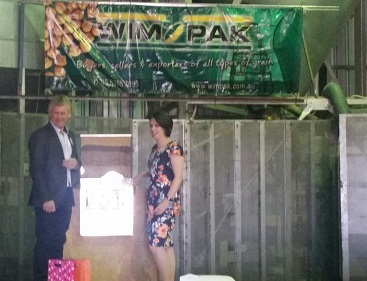 WIMPAK is leading Australia's way in cleaning and exporting various seeds and grains worldwide. They aim to provide growers cleaning, packing and trading services that are second to none. WIMPAK's newly installed industrial grain cleaning plant. "The installation of our new cleaning plant has been timely," Jo Cameron, General Manager of WIMPAK said. "It ensures we can effectively clean grain for our growers while offering competitive prices." There are four systems in operation on the new Wimpak cleaning and grading system. 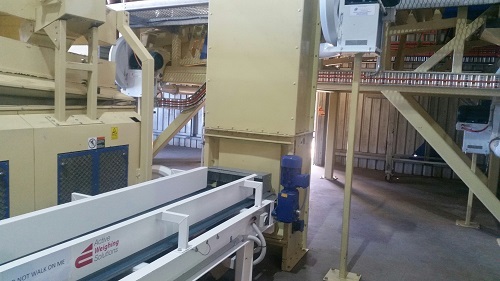 Each of these systems are used for conveying the graded seed and refuse after cleaning. Michael Francis of Pneuvay stated, "This type of installation is typical for us. There are no engineering challenges in moving grain in such a situation." "Pneuvay is well versed at setting up mobile and fixed plant bulk material conveying systems for grains like corn, soya beans and wheat to load in bulk into silos and trucks. We also service blowers throughout the grain industry, including installations storage." he added. The pneumatic grain conveying system resulted in 100% deliverability of farm products. It lead to zero waste as each component of the produce can now be used in value added opportunities. This provided a fantastic opportunity for local producers to increase both their domestic and global market sales, increasing the financial output of their farms. Pneuvay Engineering is proud to be associated with it and congratulate WIMPAK on their success. Read some of the pneumatic conveying projects we have completed.